For the past few weeks, I’ve been checking out the Cook’n Recipe Organizer. 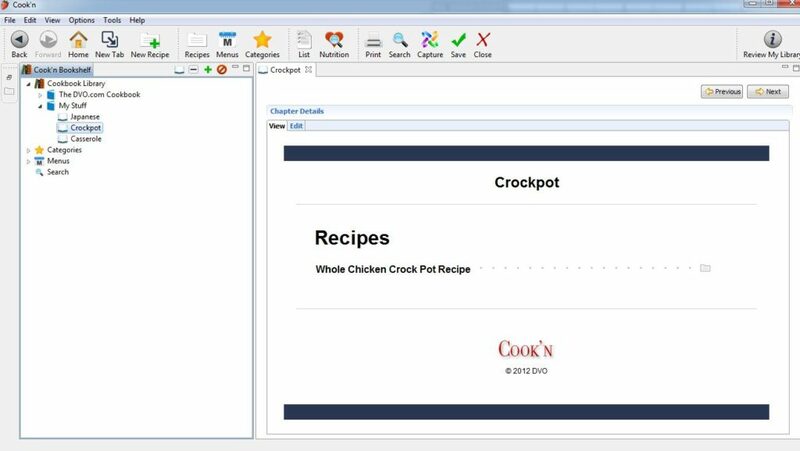 Cook’n is a program that lets you organize your recipes into your own cookbook. You can input your own recipes or capture them from the internet, then export the entire collection out to where you need it. It also has a built-in menu planner, shipping list organizer and nutrition guide. The program only took a few minutes to install. It comes with one cookbook already setup with recipes, the DVO.com Cookbook. It has a great selection of recipes and I’, eager to try them out over the coming months. I decided to create my own cookbook and start capturing the recipes off the Internet that I frequently use. To create the cookbook, all you have to do is click the ‘New Cookbook’ icon, the green + sign, and then type in a name. You can add in chapters as you go. I separated mine out by cuisine type. You can also pick out a theme to decorate your pages. Capturing is also very easy. First, you run a search in the ‘Search’ tab of the recipe that you’re looking for. You can also paste in the url as well. When the recipe comes up, click the ‘Capture’ button and the recipe will automatically be entered onto a new recipe page/card. I’ve noticed that on the Mr. Food recipes it doesn’t get the directions all the time, but all you have to do is copy and paste them in. The grocery list is pretty neat too. You click on the recipe to open it up, and then click the ‘List’ button. The list will be generated automatically and you can add or remove stuff as needed. It also includes prices, giving you a rough estimate of how much everything will cost. The menu generator also connects to the list, and will give you a complete list for all your planned meals. You can also print your recipes out onto cards or export them into HTML files and email. They are currently working on a sync feature that will allow you to send your cookbook to your iPhone, Android, tablet and more. Overall, this is one of the best programs ever. I can get all my online recipes in one place and easily pull them up whenever I need them. All the extra features are just icing on the cake. The program costs $79.97 and can be used on most systems. The sync feature will cost extra since you have to purchase the app for which ever device you are going to put it on. The cost for the main program is worth it since you will get many years of use out of it. For more information, you can visit the Cook’nwebsite, or check out their Facebook page. Last updated by Angela Rogers at September 5, 2014 . BUYER BEWARE – They refuse to honor their guarantee. I evaluated the software for two weeks and on December 26, I send an email to the address provided in my order confirmation stating that I would like a refund. I know they received the email because I received an out-of-the-office message stating they would reply after the holidays and wishing me a blessed Christmas season. In that email, I provided three reasons for my decision which I’ve listed below and indicated that I would like them to purchase the software of my choice “Living Cookbook”. As of today March 4, 2013, I still have not received either a refund or the software product of my choice despite two additional emails. One sent on January 22, 2013 and one sent on February 10, 2013. I am using Living Cookbook and find it a far superior product at about a third of the cost of Cook’n. 1) When I view a recipe in Living Cookbook, I am able to see both the recipe ingredients and the nutrition information all at the same time. With Cook’n I have to click to a different page and scroll over to see the entire report of the nutrition data. 2) When I print a recipe with Living Cookbook, the format is clean and simple and the nutrition information is automatically included without any extra configuration or option selection. 3) The Living Cookbook import did not maintain the hierarchy of cookbook chapters. Recipes were placed only in the lowest level cookbook chapter. I have been using Mastercook for years. Thought I would try this to see what it was like and to get the recipes on it. As far as I’m concerned, it’s worthless. I looked at a pork recipe and got the cost/nutrition for it. To my surprise, a 10 oz can of cream of mushroom soup costs $4.49. So I went back and looked at a cheesecake recipe. The cost/nutrition for this was still for the pork dish. There was no way I could find to get the information for the cheesecake. I find the program itself very hard to use compared to Mastercook. I would not recommend this program to anyone. I should mention that I don’t have the organizer, just a module, so maybe that makes a difference, but no way would I pay $80 for it.